A couple of months ago, Mood sent us a fistful of swatches to show us what they had in new for spring. Of course everything on the swatch cards was something amazing – metallic linen, chambray, Swiss dot, spring boucles, matte jersey – but what really caught my eye was this bright blue eyelet lace, simply labeled “lace outerwear.” Never mind that I couldn’t think of any use for the stuff, I HAD to have it. I mean… look at that! It’s so gorgeous and blue, and those big embroidered flowers are my favorite thing ever. The fabric itself is perfect for outerwear – what little fabric parts there are (the insides of the flowers) is actually water-resistant, and the resulting piece has a nice body and brilliant saturated color. Editor’s note: I just looked for this fabric at Mood NYC and–waah!–it’s all gone. However, I think some of our nylons and taffetas make great spring coats, so check these out. 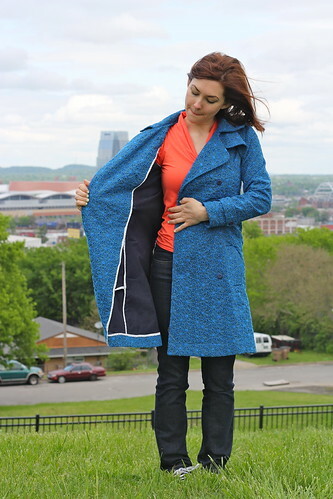 My perfect pattern came in the form of the Robson Trench Coat, from Sewaholic patterns. Apparently, lace trench coats are HOT for Spring – in which I didn’t need any more convincing to snap up that eyelet lace! I paired my eyelet lace with a medium weight cotton sateen in navy, so the coat would be opaque and to also add a layer of warmth. I actually spent a long time debating on what underlining fabric to use – as I didn’t want anything too sheer or heavy, and I needed something that would work with the lace. 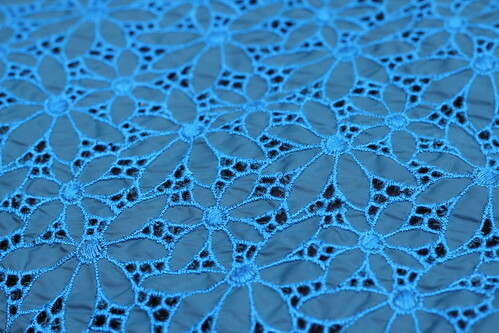 This sateen is a similar weight, so it gives the lace extra body without making it took heavy or thick, and provides a dark backdrop to the bright blue. I also liked that it is less shiny than traditional sateen. The only drawback to this stuff is that it attracts ANYTHING that might be floating around your sewing room – my personal kyrptonite being cat hair and stray threads. Fortunately, a quick sweep with a lint roller eliminated any extra fuzzies without much hassle. 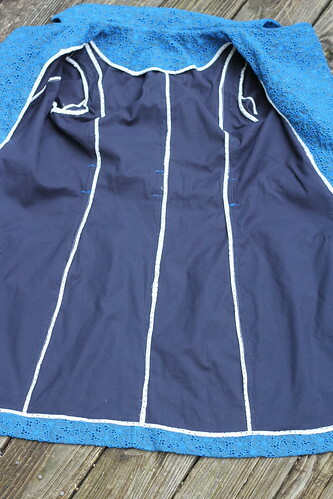 The coat is unlined, and all the inside seams are bound with bias binding. Since I like my clothes to look as pretty on the inside as they do on the outside, I used polka dot cotton batiste from my stash and made my own bias binding. And before you ask – yep, that step took forever! Worth it, though, I just love the way it looks! I was a little concerned that sewing this heavily textured lace would prove to be difficult, but it really wasn’t so bad! The seams did prove to be a bit bulky when it came time to add the binding – which meant I did a whole lot of trimming and grading. However, the actual sewing was pretty straightforward. I used a universal needle and found that I did not need my walking foot to keep the layers in place. The lace also did not show any pin marks, which is awesome because I used a LOT of pins to hold this thing together! I could not be more thrilled with my finished coat – all the workings of a classic trench, but sewn up in a beautiful (and colorful!) lace! Yes!! 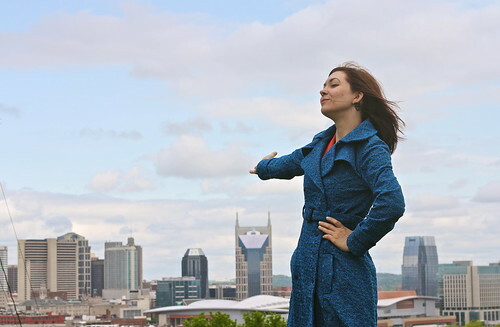 Special thanks to my friend Jenna for taking these gorgeous pictures (oh yeah, you didn’t think I took these, did ya? :)) and capturing our beautiful city in the background.